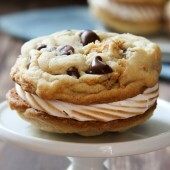 Chocolate chip s’more cookie sandwiches, using freshly made chocolate chip cookies and homemade marshmallow frosting. Enjoy your favorite campfire treat year round! In recent years, July has been our cool Summer month and August heated back up. But this year it’s been opposite, at least so far. Not to say it won’t or can’t warm up. We’ve even had warm Octobers and random mid Winter warm ups, but I have a feeling we won’t be seeing weeks of high temps again until next year. We’ll see though. And honestly, though in some ways that makes me sad about Summer ending, it also makes me ridiculously excited for Fall. I love Fall. So. Much. You don’t think about pumpkin pie in May, right? Or how about lemon cookies in November? Sure, those are only two options, but still. You get the point. Campfires … warm or cool weather … perfect s’more season. Any season. What’s awesome about these s’mores, besides the obvious taste, is there is no campfire needed! Clearly campfires and s’mores go hand in hand, but if you can’t have a campfire, that doesn’t mean you can’t have a s’more! No one should ever be denied a s’more on the basis of not having the ability to have a campfire. Bake up an amazing batch of chocolate chip cookies. Trust me, this one is it… the right amount of crisp, soft and chewy with a hint of sea salt and loaded with chocolate chips! The. Best. Sandwich them together with gooey homemade marshmallow frosting! The final touch – a quick toasting. 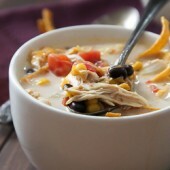 They’re finger licking good and a must make regardless of the season! 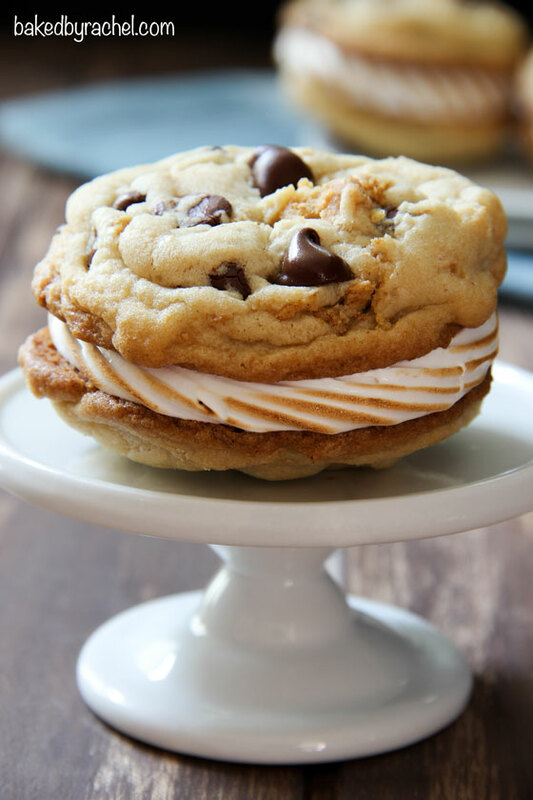 Chocolate chip s'more cookie sandwiches, using freshly made chocolate chip cookies and homemade marshmallow frosting. 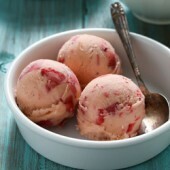 In a large bowl or stand mixer, cream together sugars and butter until smooth. Beat in egg and vanilla, scrape bowl as needed. Mix in salt, baking soda, baking powder and flours until no streaks remain. Mix in graham cracker pieces by hand. Cover and chill until firm, roughly 2-4 hours. Preheat oven to 350°F. Line a baking sheet with a silicone baking mat. Using a medium cookie scoop, place dough 2 inches apart. Bake for 13-15 minutes or until edges are just golden brown. Immediately transfer to a wire rack to cool completely. When cookies have cooled completely, prepare marshmallow filling. In a medium heat proof bowl over simmering water, whisk together egg whites, sugar and cream of tartar. Continue whisking until sugar has dissolved completely and egg whites are warm to the touch. Transfer to a stand mixer, with whisk attachment, whisk on medium-high speed until stiff peaks form. Mix in vanilla in the last 30 seconds. Transfer mixture to a large piping bag fit with desired piping tip. Alternately a large plastic bag may be used with the tip snipped off. Pipe marshmallow frosting onto flat side of one cookie, press another cookie on top to form a sandwich. Repeat with remaining marshmallow frosting and cookie halves. Use a kitchen torch to lightly char the frosting. 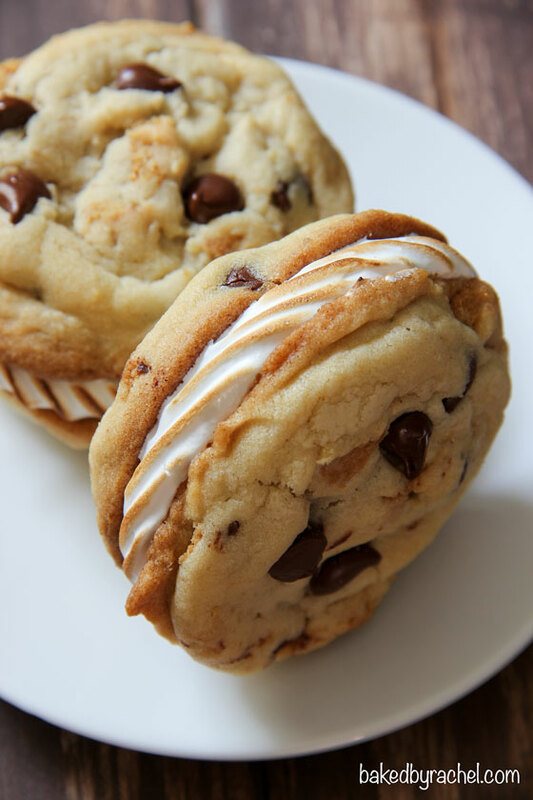 I agree – s’mores are not just for summer!! 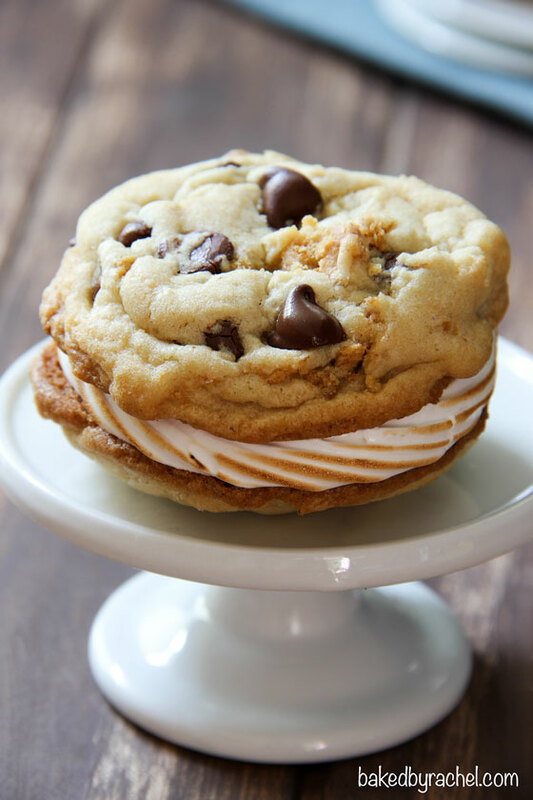 LOVE these cookie sandwiches Rachel…the toasted edges would be my favorite part, I’m sure! I’ve been OD’ing on Graham crackers all summer and been making s’mores indoors using my brulee torch – now with cookies? YOu’re a gosh darn Evil GENIUS!!! I didn’t think I could love a picture more than your cupcake, but this one… s’mores is your thing, girl! I was just looking for a chocolate chip cookie recipe that involved graham crackers for making cookie s’mores! This is perfect, I will need to try it next time we’re making a fire. It just didn’t really seem like a s’more with regular chocolate chip cookies, I missed the graham cracker part! These look so amazing! A mash up of some of my favorite things :) Pinned! Oh my foodness! This is like a dream come true! Wow, what a creative idea! This would be a super impressive dessert to bring to a party… or to finish off the meal when company comes over for dinner. now this is my kind of s’more! YUM!! I love any food that brings back childhood memories. S’ mores are one of those delightful comfort snacks. I love how you transformed it into a sandwich cookie! Thanks for sharing. Holy yum! I might just need to eat the entire batch! The toasted edges just put me over the edge!! LOVE! Oh my, these look amazingly good! !